Painting is an expertise that anyone can develop. Individualized instruction and regular dedicated practice will help you reach your goals. At Flying Dolphin Studio students will learn about various types of paint, brushes and how to prepare surface areas before applying paint. If this is your first endeavor with painting we recommend you start with the Introduction To Painting Basics. This is a 2-hour class that covers the fundamentals of painting and will start to on your path of becoming the best painter you can be! 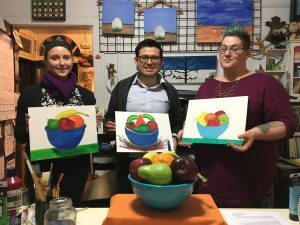 This entry-level class will provide a great foundation for students to explore their creative side utilizing paint and brushes as they learn to express their creative vision on canvas. Explore color and form through the use of acrylic paint while you experiment with mixing colors and learning techniques with various brushes and pallet knife. Students will work from a still life bowl of mixed fruit. Supplies included: One 11in x 14in canvas board, acrylic paints and brushes. Use Buy Now button above to reserve your seat in an Introduction to Painting Basics class. Escape from the stress of your every-day-life and reconnect to your passion. Express yourself fully and freely, and ignite your creative potential. The process of intuitive painting allows an individual to tap into their creativity without concerns based on end results and encourages a greater trust in their intuition expanding a sense of freedom and possibility. This approach gives the individual permission to explore their unknown creative potential. Approaching art in this manner can transform not only your relationship to creative blocks around artistic expression but can also help to transform those attitudes and habits that keep you from applying your imagination and courage in the challenges of your daily life. In this class individuals will be encouraged to use various mediums (acrylic paint, watercolor, markers, pencils / pens, canvas and watercolor paper) helping them on their path of discovery. Use Buy Now button above to reserve your seat in an Intuitive Painting class.